A journey is a voyage, an exploration often to destinations unknown, a leap of faith knowing that your ability and fortitude will be tested but that the experience will propel you forward in ways you didn’t know were possible. 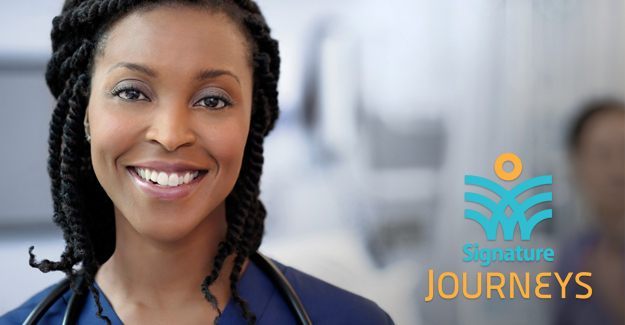 At Signature HealthCARE, we view a career journey as no different. It is an opportunity to grow and evolve, to achieve new heights and stretch oneself knowing the rewards will validate the effort. It is a personal endeavor, unique to each individual – but you won’t go it alone. Our mission is to revolutionize health care, and we think we have a pretty good start. But we need people with like minds and hearts to advance this mission. If you are passionate about advancing health care and aging care, we would love for you to consider pursuing a career with us. The Signature team has grown considerably and is now 20,000 strong, with locations across 10 states and service opportunities across the health care spectrum, from nursing and clinical caregivers to leadership and other administrative roles. Please take a look and see if you find an opportunity that might be right for you.